IMG_1026, originally uploaded by All Things Mimi. Day before yesterday I cut up 2 boneless chicken breasts and marinated them in a mixture of plain yogurt and red curry paste. When I got home this afternoon, I made kebabs with the marinated chicken pieces, red and yellow peppers, portabello mushroom chunks, onion and grape tomatoes. I put them under the broiler, turning every 3 minutes. The veggies were tossed in olive oil, salt, pepper and a little spice blend. 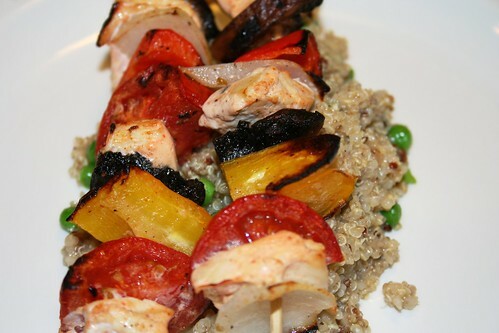 I served the kebabs on a bed of quinoa pilaf. I toasted the quinoa in olive oil over high heat for about 2 minutes. Then I put it in a saucepan with chicken broth and a bay leaf. I brought it to a boil, then covered it and turned the heat down to low. After 20 minutes, I uncovered and mixed in a few frozen early peas, some parmesan cheese and a little olive oil. A tasty meal to end the work week!